The otoscope makes it easy to view and examine the auditory canal and eardrum. Ear exams typically take place in ENT surgeries, although they can still be done by general practitioners. 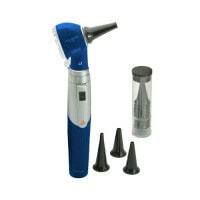 In our online shop, you may buy otoscopes with varying illumination types, as well as disposable ear specula, at affordable prices. 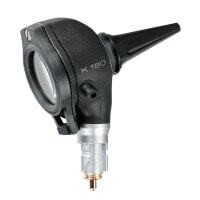 Stethoscope, otoscope, ophthalmoscope, audiometer, etc. from 119,70 EUR* Not ready for shipping. Reserve today and we will ship as soon as possible. 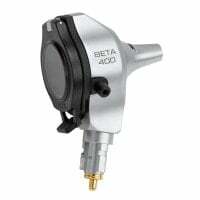 from 104,95 EUR* Not ready for shipping. Reserve today and we will ship as soon as possible. from 99,95 EUR* Not ready for shipping. Reserve today and we will ship as soon as possible. 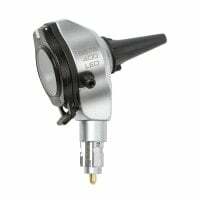 Otoscope use light and a special design to examine the outer auditory canal and eardrum without excessive equipment (otoscopy). 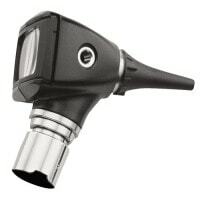 Otoscopes are not only useful in ENT surgeries, but also often come into use by general practitioners. 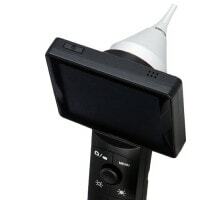 Otoscopes are also available with many different light sources, which provide various colour temperatures, such as those with LED (i.e. 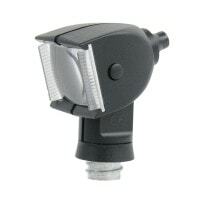 LuxaScope) or halogen lighting. 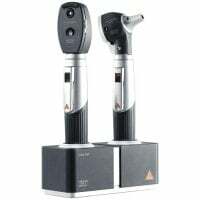 In addition to common otoscopes, there is also the video otoscope with which ear examinations can be recorded and saved. This makes it possible for exact comparisons to be made between multiple exams with the same patient. 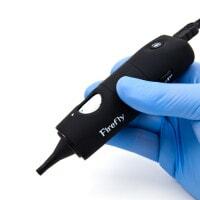 Furthermore, the patient can view the otoscopy live, which positively influences doctor-patient interaction. 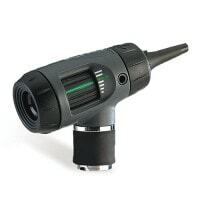 The pocket otoscope can comfortably be carried around the office, thanks to it's compact build; fitting nicely into your gown or jacket pocket. This also allows you to carry out ear exams outside of the treatment room. 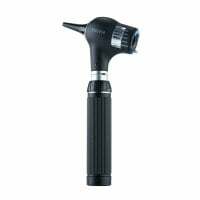 The otoscope usually consists of an instrument head, a handle/battery handle and an ear speculum, which is placed inside the auditory canal during examination. 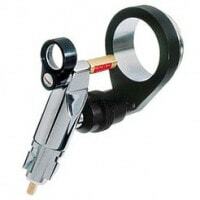 Most manufacturers offer otoscopy equipment that allows for the use of different instrument heads (e.g. 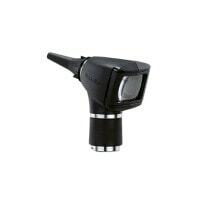 otoscope, ophthalmoscope or dermatoscope heads) with the same handle or rechargeable handle, and interchanged. 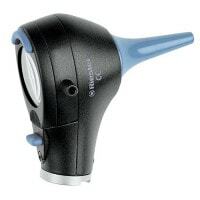 With Praxisdienst, you will find a large otoscope selection from name brand suppliers like HEINE, Riester, LuxaScope and Welch Allyn. 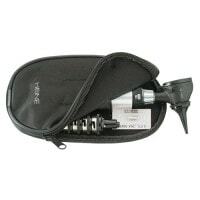 We also provide individual instrument heads, as well as otoscope sets, consisting of an otoscope head, handle and case. 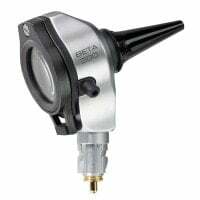 For compatible otoscope accessories–disposable ear specula, replacement bulbs, etc.–you should have a further look into our Otoscopes and Ophthalmoscopes category. 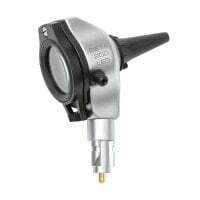 Do you have questions about an otoscope light source, disposable ear specula or other products and equipment in our shop? Our customer support team will happily help you. Use our online request form, write us an email or give us a call. 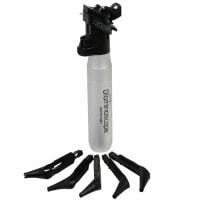 You should also check back for new equipment and accessories for use in various health and care facilities.